Our time on St. Lucia was a week of utter chocolate bliss. As mentioned in the previous post, we had three glorious days at Hotel Chocolat Boucan, a boutique property owned by British chocolatier Hotel Chocolat and situated on the 140-acre Rabot Estate, the island’s longest-producing cacao plantation, operational since 1745. We toured the estate with cocoa production manager, Cuthbert Monroque, who explained that unlike nearby South America, the biggest problem his cacao-growing team has to deal with is rats. Yes, there are so many rats trying to bite into the sweet pulp of the ripening cocoa pods that Monroque has had to establish a rat-drowning regiment to keep things under control. This photo shows how a rat chewed his way into a pod and ate the flesh and cocoa beans from within. 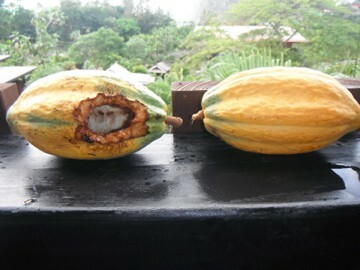 The cacao pod on the left was eaten by a rat as they enjoy the sweet flavour of the pulp inside the pod. Another challenge for St. Lucian cocoa growers are mushroom spores, which spread the fungus that has been destroying some of the crop. As Rabot Estate is an organic property, no pesticides or fungicides are used. The resort offers a “Tree to Bean” tour as well as a “Bean to Bar” tour to help chocolate lovers understand how cacao is grown and how the beans are harvested, cleaned, fermented, dried, and processed to make chocolate. We grafted seedlings and put our name on them so that we could return in future and see the cacao tree that we helped create. Cuthbert makes a special tea that he uses to fertilize the seedlings, and that, combined with a special manure mixture help make the cacao trees strong and healthy. Grafting the seedlings helps reduce the time it takes for them to bear fruit. In the photo above, Cuthbert shows us how to graft a cacao seedling. Without grafting it may take up to three years for a cacao tree to produce pods. With grafting, that period may be reduced to as little as 18 months. Hand grinding cocoa nibs to make chocolate is no easy task, but is so worthwhile. We ground cocoa nibs with a pestle and mortar and saw them slowly turn into molten chocolate. It was a lot of hard work, but worth it to see the dry cocoa granules slowly turn to cocoa liquor, a liquid form of chocolate that we added cocoa butter and sugar to, resulting in our very own personalized chocolate bar. I’d highly recommend a visit to Hotel Chocolat Boucan and St. Lucia for any chocolate lover who wants to learn more about the chocolate making and growing process while staying at a luxury resort with amazing cocoa cuisine. Have you had a chocolate experience like this? Have you ever tried hand-grinding cocoa nibs and making chocolate from it? Oh wow, we just think of that delicious chocolate bar and not how it get to that state. We never consider the challenges a farmer faces harvesting cocoa beans. Rats?… All I can say is yuck!! Beside that the whole tour looked like a blast. Thanks, Susan. Yes, that’s why I’m writing the book. To give chocolate lovers a glimpse at the whole picture. I’m glad you’re enjoying the ride! Doreen — I’m still so envious of all the wonderful trips — and chocolate tastings — you’ve experienced. You’ve become the Chocolate Diva! Thanks, Jeannette! I appreciate the confidence you have in me, and like the term, “Chocolate Diva.” Another friend has christened me the “Queen of Chocolate.” I’ll take either, for after 3+ years of completely immersing myself in the world of chocolate, I like to think it’s given me that level of expertise that makes this blog worth reading. And ultimately … the book worth buying. Cheers! Liquid chocolate sounds absolutely delicious. I’m yet to have an experience like this but really enjoy reading about your journeys as always. Thanks so much, Salika. It’s great having you along for the journey. I’m hoping my posts (and my upcoming book) will inspire people to make chocolate journeys of their own. Yay, Cheryl! It’s great having you along for the ride. Just as I don’t enjoy solitary travel, I really enjoy having my friends, supporters, and chocolate lovers along with me on these virtual journeys as well. Wow! By just looking and reading your blog, I want to munch on some chocolates right now!!! Right on, Joy! That’s my goal! To increase everyone’s appreciation of fine chocolate, and to encourage you to head out on your own Chocolatour. These trips and chocolate tastings envy me. Chocolates always fascinate me and your share increases the temptation . Enjoyed the share. Hi Purnima: Don’t be envious! Plan your own chocolate journey! If you can’t go to exotic places, there are places in your own backyard (your vicinity) in which you could take a chocolate workshop, visit a new chocolate shop, try a unique flavour, etc. chocolate is all about sensual pleasure, and there are many ways to do that. You’ve just helped me decide the topic for my next post. Stay tuned! Sounds and looks fantastic Doreen. And not to forget, delicious. Would love to get on a plane right now and spoil myself there. A storm so bad they are warning people to go outdoors is about to hit Southern Sweden and Denmark..
Catarina recently posted…Should women be as ambitious as men? Oh, dear! Stay safe, Catarina! Hopefully, your weather will soon tame down and all will be well again. I’ve not yet personally explored chocolate in your region, but have certainly enjoyed eating some. Oialla from Copenhagen is the best from Scandinavia that I have tried to date. Have you tasted it? Hello Stacey and thanks for your comment. The good thing about fine artisanal chocolate is that it is not too fattening. Just eat one bonbon, truffle or piece of a dark chocolate bar and it won’t put the pounds on. This sounds like an amazing experience! Grinding fresh cocoa beans into your very own pure chocolate, that is really awesome. It will be cool to go back there one day and see how much the cocoa plant you helped plant has grown. Yum, now I’m craving chocolate. Hi Kelly and thanks for your comment. Yes, I would indeed like to head back to St. Lucia and see the Hotel Chocolate chocolate factory when it opens in 2014, and also to see the new resort that Nick Troubetzkoy (owner of Jade Mountain) is building called “Jade Sea” that is expected to open in 2014. Two more reasons to revisit the island of great chocolate. I envy any experience such as getting to grind the beans to make pure chocolate. So much about the process behind creating various foods often gets lost on people, including myself. Thanks, Jeri. That’s indeed why I’m writing the book. I know that people like to travel. And I know that they enjoy fine chocolate. So I have married the two concepts and hope that readers will venture out for some enticing chocolate travel. Stay tuned! Kristine recently posted…Architecture and nature co-existing happily together – is it possible? Will do, Kristine. The blog is just a prelude to the book. I’m whetting your appetite here and hope you will look forward to reading the book when it comes out this spring. You’re welcome, Emilia. That’s what a writer’s job is : to share stories, and ignite emotion in the readers. Glad you feel that I’m doing my job! Loved the chocolaty trip indeed! Thanks for the trip. You’re most welcome, Fatima. Thanks for coming along for the ride! Stay tuned for the next post, when we’ll look at the sensuality of chocolate, just in time for Valentine’s Day. Doreen – what an amazing experience! 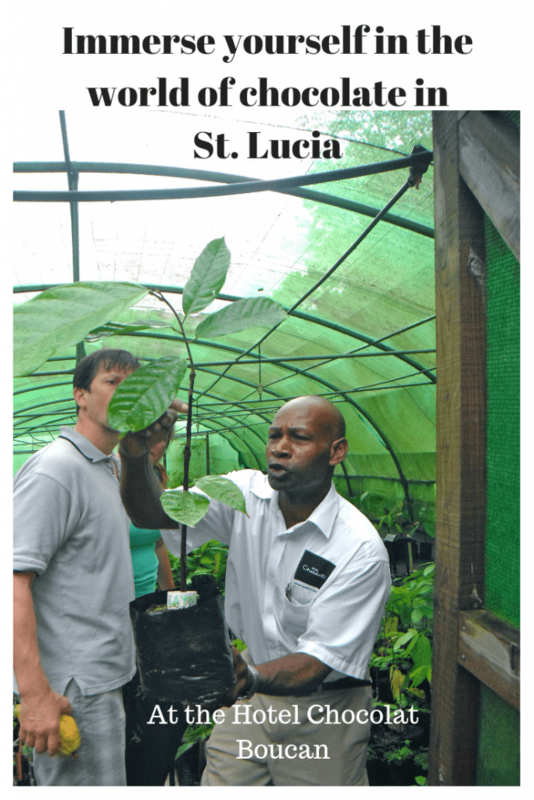 I hope to return to St. Lucia one day and if so I would love to experience this wonderful property and chocolate adventure! Thanks for sharing; I’ll place a link on our website so our fans and friends can read about it too! Thanks very much, Deb. Yes, we truly enjoyed our week in St. Lucia. Each of the places we stayed was fab in its own way. Did you also see the posts on Jade Mountain? Yes, I absolutely did – it looks so amazing. 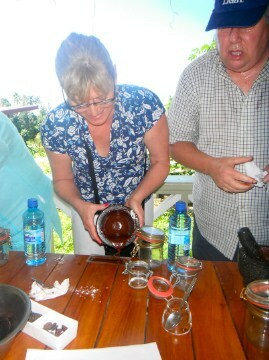 Would love to back there to stay at Jade Mountain and tour the chocolate chocolate hotel! Whenever I read your posts, it seems as if I am diving in the chocolate waters. The post is indeed delicious with great pictures. Thanks for sharing the tempting share. Thanks, Aayna. I’m so glad my chocolate travels are coming to life for you thru my posts. Stay tuned! There are many more to come! I love chocolates. I want to try this tour with my kids about chocolates. This is something worth trying especially by chocoholics like me. Hi Kelly: The chocolate events I have highlighted here on St. Lucia are not intended for children. They are held at high-end resorts which target their programs to adults and children over age 14. I know that there are quite a few chocolate destinations such as Hershey, Pennsylvania in the US and World Chocolate Dream Park in Shanghai, China that focus more on smaller children. Enjoy your chocolate travels, and stay tuned to this blog for more info! Chocolate and nothing but chocolate. You’re a girl after my own heart Doreen! I’ll be sure to check out the hotel that you have featured in your post for today. I’m planning on a cruise, maybe a trip around the world this year as part of my dreams. Hi Calra: St. Lucia is definitely a port on many Caribbean cruises. However, the ships doc in Castries, which is in the northern part of the island. Most of the cocoa is grown on the southern part of the island near the city of Soufriere. You may be able to take an excursion or hire a taxi to take you to the cocoa belt, but instead, I’d recommend a visit to come, stay, and become immersed in the world of chocolate. A new kind of educational tour that I want to try as a chocoholic. If I can grow cocoa in my backyard, I will surely do it. Thanks for this information. Hi Sandra: Thanks for your enthusiasm! Cocoa can only be grown in regions between 20 degrees north and south of the equator. It is actually quite a difficult plant to grow. I will be having a chapter in my book that features some of the challenges the cocoa farmers are up against. Hello again Doreen! I just love how you project your love for chocolate in your website. It’s very refreshing to read posts about the things that you love, like little indulgences such as chocolates. Hotel Chocolat Boucan? That would be on my list this year for my vacation getaway! Thanks so much, Veronica! That is one of the most cherished compliments a writer can receive. If I can instil enthusiasm from you in the subject abut which I’m writing, I feel I’ve accomplished my goal. Glad you are enjoying the journey along with me, and that it is inspiring you to plan a similar trip of your own. Shouldn’t keep reading your posts with the word chocolate everywhere gets my taste buds going to much. Right I have just been looking for airline tickets to the Caribbean. Friends of ours that we sailed with in the med have just gone across to Antigua. Thought with the economic climate there would be some cheap air tickets. Wrong. Looking for other strategies now. One was fly in to Miami then try to get a cheap ticket across from there. Or sometimes you get cheap last minute holidays and just use the flights. Hi Lee: Glad to have you onboard! If you’re looking for a Caribbean island that features a great chocolate experience, St. Lucia is tops. But Grenada, Trinidad, Dominican Republic are growing great cacao and making good chocolate as well as having tours to cocoa plantations. Sorry, I haven’t been to Antigua, nor do I know much about it or possible travel deals. We do, however, have several travel agents who regularly read this blog and I invite them to get in touch with you privately with suggestions. Have a super trip! I think this is great! I love getting to see and understand what goes in to making a chocolate bar. Hi Doreen! I am a travel website owner for tours to India and it is sounds good to find travel blog to know. India is definitely on my list for the future, but more longterm, as it will be covered in volume III of Chocolatour. Thanks for visiting the blog, and do stay tuned! This sounds like such an interesting experience, usually we don’t get to see how chocolate is made, so being able to sample it direct from the source really is quite something! We were at the Hotel Chocolate in St. Lucia a few months ago. A tasty experience, grinding and grinding. Loved it! Hi John, and thanks for stopping by. Yes, Hotel Chocolat Boucan is an amazing place for chocolate lovers. Really enjoyed it. Are they now selling Hotel Chocolat products from there? I was quite disappointed that they weren’t when I was there several years ago as they make terrific chocolate in London, but are currently working on building a chocolate factory in St. Lucia.